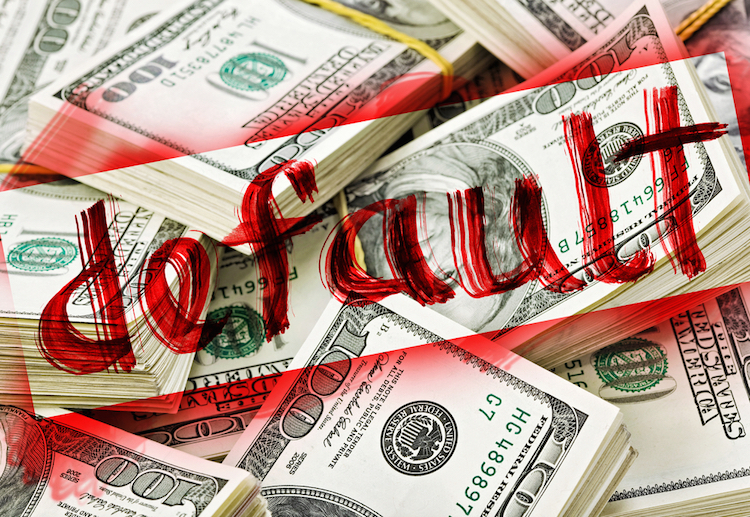 Will the BLACK MONDAY of June 29th trigger the Great Default of 2015? Or will it be Black Monday, July 6th? The unending Greek debt crisis and imminent departure from the European Union marks the beginning of the end of the euro … which marks the beginning of the end of the US dollar … which marks the beginning of the end of the Japanese yen. The present Greek government has distinguished itself by telling the truth. They have been telling the Greek citizenry the financial facts and economic consequences of staying with the euro during their few months in office. The day of reckoning has now arrived — Monday, June 29, 2015. Greece has always been the Achilles’ heel of the EU. It was only a matter of time that it would bring down a fictitious and fabricated European Union (EU) that is so fatally flawed in its design that it was doomed from the very start. The real question here is: What took it so long to begin to dissolve? 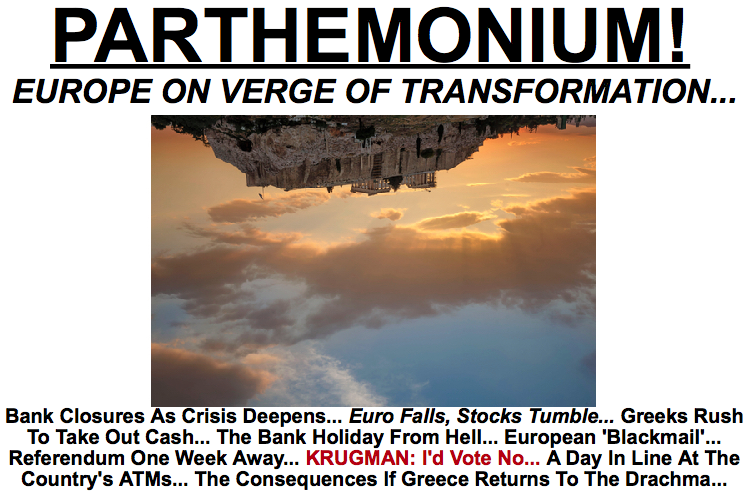 What the Greek calamity has done is reveal the sham of sovereign debt the world over. The entire process of ‘saving’ Greece has laid bare the incessant institutional blackmail and bribery, extortion and coercion which has kept the whole scheme in place for decades. Because of the now massive sovereign debt levels, it all had to collapse sooner or later. What poetic justice there is in tiny Greece, home of Achilles, serving as the weak link and trigger point for an historic transformation of the global economic and financial system. Here is a country that was run over during the world wars of the last century. It has been the victim of many economic injustices and financial abuses only because it was small and powerless. That’s not to say that the Greeks themselves do not have a hand in this unfolding Greek tragedy. However, it was their government(s) which has always sold out the people, as they do in virtually every nation on Earth. In fact, many other nations, large and small, have been victimized by the very same debt scam run by the IMF and World Bank, Wall Street and the City of London. It has been going on since the creation of the Federal Reserve in 1913 which is well over a hundred years. This form of economic exploitation and financial extortion actually began with the chartering of the East India Company in 1600. Regardless of how the Greek sovereign debt crisis is resolved, it has already done profound and irrevocable damage to the whole misbegotten system. The ongoing crisis has revealed the complete lack of reality by which the international bankers conduct their business. Greece could never be expected to agree to the banker’s terms, unless they accepted the notion of national suicide. Because their current political leaders opted for full disclosure, the Greek people now know the extent of their debt slavery. They also know that they must be forever emancipated from the Troika-run* debt plantation. Because their truth-speaking government broke it down in drachmas and dollars, euros and deutsche marks, the people could make an informed decision about how to proceed. That’s why Monday, June 29th will go down in history as the Black Monday of all Black Mondays. *The Troika is made up of the European Central Bank (ECB), the European Commission (EC), and the International Monetary Fund (IMF). Not only have the Greeks liberated themselves from the EU debt plantation, they have also unshackled themselves from their own governmental imprisonment. Each successive Greek government has worked in league with their EU masters until the current one was elected. Each administration proved to be as willing to exploit and abuse the Greek citizenry as the previous governments had … until now. At the end of the day, only the tag team of Prime Minister Alex Tsipras and Finance Minister Yanis Varoufakis have truly served the interests of the people of Greece. By working in tandem throughout the evolving crisis (better known as an awesome opportunity) they have resisted every initiative by the international bankers to further bankrupt their nation. They have also staved off every attempt to steal Greek assets as well as the remaining wealth from businesses and families. The Black Monday of June 29th, 2015 is only the first of many Black Mondays of 2015 that will culminate on the BLACK MONDAY of all black Mondays — September 14th. 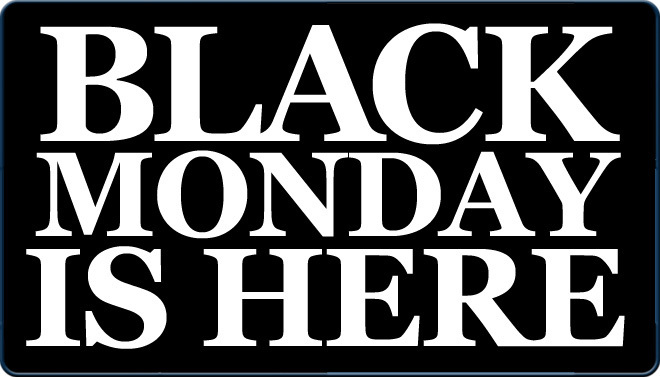 On that particular date will Global Economic and Financial System (GE&FS) will experience the final BLACK MONDAY of this millennium. The events which occur between now and then will dictate the severity of the inevitable collapse of the GE&FS. It is no longer a matter of “If”, it is only a matter of “When”. 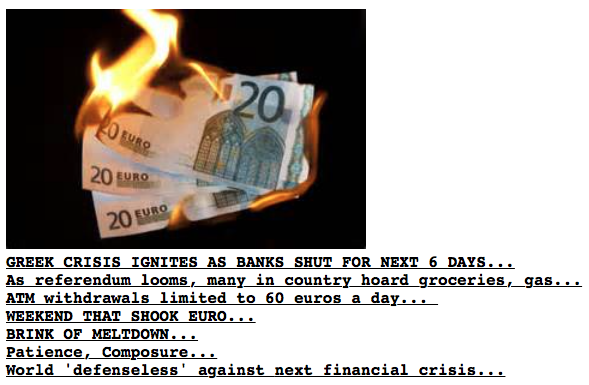 The following headlines from today — June 29th — dramatize the true gravity and pervasiveness of this global debt crisis and monetary collapse. The international debt crisis picture only grows bigger and more ominous by the day. As the following headline indicates, the governor of Puerto Rico has brought the territory out of the debt closet. Not only does he state that their debt is unplayable, it’s unplayable to the tune of $72 billion. When small states like Greece and Puerto Rico are literally drowning in debt what does that really mean, especially when much larger nation states are under much more water. Some of the bigger economies of the European Union have been swimming in debt for many years, only adding to their sovereign debt total by the day. Likewise, the United States has a debt profile as bleak as any nation on Earth. Regardless of the metric that is used to capture the total U.S. national debt, most economists now agree that it will NEVER be paid back. $18,285,653,476,742 and counting is a lot of money even for the ever-enterprising US of A. If you click on the following link, you will be quickly sobered up by the increase of debt which has occurred since today, June 29th. Because the American corporate juggernaut so successfully globalized the worldwide economy, it’s commercial and banking sectors are inextricably intertwined with the EU and Japan, with China and India, as well as with many other countries. What happens to or within any of these economic powerhouses will necessarily affect the USA. Similarly whatever eventualities are in store for the American economy will have deep impacts on those nations. Hence, if Puerto Rico goes belly up, the USA will suffer some serious consequences, the greatest of which is its perceived capability to continue to service its debt. The collective perception of the world community of nations is, after all, the only thing that is keeping the whole debt scheme afloat. That the entire Earth realm was transformed into a veritable planetary debtor’s prison was quite an accomplishment for the Anglo-American juggernaut. The international banking cartel has been running this multi-decade scam on the global community seemingly forever. They have gotten away with it because the governments of nations like Ireland and Portugal allowed them to get away with it. Iceland, on the other hand, did not let them foist a plan of legalized theft and asset forfeiture on their country. In fact, Iceland has kicked the offending banks out of the country and dropped their bid for EU membership. They have also prosecuted and upheld the convictions of those banksters who defrauded their entire nation. Greece and other vulnerable countries have been closely watching the whole specter of possibilities and eventualities jump off since the stock market crash of 2008. With each passing year it becomes more apparent to them that the end is quite near. The very paradigm upon which the GE&FS is based has proven to be so defective and untenable going forward that it is destined to collapse. The Shemitah Jubilee presents the perfect window of opportunity for the GE&FS system to be discarded, once and for all. It no longer serves the nations nor the people of the planet. As September of 2015 approaches, the cascading events will conspire to release a world that is literally immersed in debt. 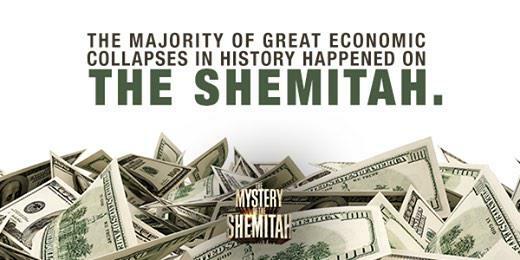 The very purpose behind the upcoming 70th Shemitah Jubilee is to remove a debt burden that is now too great for the world to sustain. The people of the world can no longer continue to bear the crushing debts from yesteryear. Lastly, it ought to be abundantly clear to anyone watching this devolving saga that the remainder of 2015 and all of 2016 will take the whole world on the roller coaster ride to end all rides. Whether you live in Greece or Iceland, the USA or UK, Iran or Syria, Russia or China, the terminal breakdown of the GE&FS will deeply affect every nation, as well as every resident of Planet Earth. It is highly advised for those looking for more insider understanding and historical context to consider the following essays linked under “Endnotes”.